Do you dream of a vacation where you can have the most relaxing, rejuvenating experience imaginable? Camps Bay is where luxury and comfort is standard and where quality finishes are expected and we make sure our accommodation lives up to that. 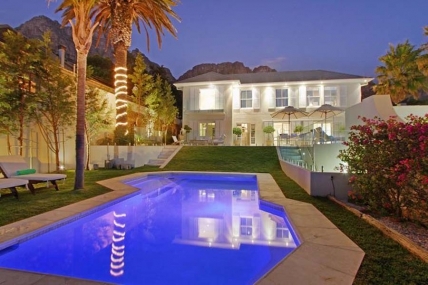 We source luxury self-catering holiday homes and villas throughout Camps Bay with luxury amenities like full surround sound entertainment systems, jacuzzi hot tubs, swimming pools, fully equipped modern kitchens and tasteful decorations. When it comes to that time of the year (or maybe the week) when you are in dire need of a getaway from all the stress of your day to day life, we are here to help you to find fully furnished luxury holiday accommodation with magnificent views and modern features to help you forget about all the hardships you face every day. We're certain that the views you'll see simply driving to Camps Bay will help melt away all of your stress so once you arrive your vacation is already off to a good start! 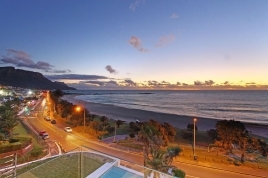 Our holiday villas in Camps Bay are fully furnished from the basement level up to the top floor. Bedrooms have comfortable, quality beds with luxurious bedding so you're guaranteed a good night's sleep. You deserve it. We ensure the holiday homes we take on have kitchens equipped with top of the line appliances. Now that you finally have time to relax you can make yourself or your family a delicious home cooked meal with the finest local ingredients. Sounds yum! Holidays are not just about sleeping and eating at your leisure, although it does play its role. We make sure that our holiday houses also have ample entertainment whether you're there with friends or your family. We take care of the finest detail to the bigger important things, although of course all accommodation has a different selection of features. 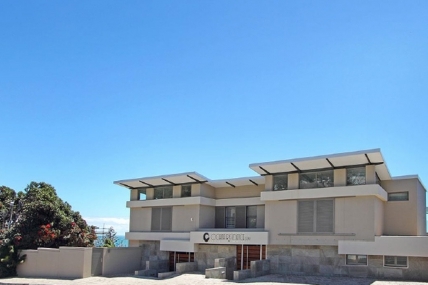 Our Camps Bay homes built over two or three levels are very spacious and often have large entertainment rooms with wonderful things to do like large screen televisions with satellite channels and surround sound or pool tables and foosball tables. 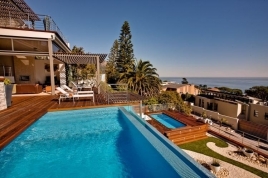 Most of our self-catering holiday accommodation in Camps Bay has swimming pools with crystal clear water and comfortable loungers by the pool. 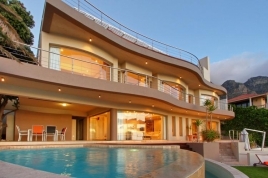 Luxury villas in Camps Bay offer Jacuzzi's indoors or outdoors. Imagine that, relaxing in the hot tub of your fully furnished holiday house, soaking away all of your stress and frustration, perhaps a glass of wine in hand or a light novel. It's your holiday, it's your time to relax. When you hop out the Jacuzzi hours later and step into your fluffy towelling robe and slippers we have no doubt you'll feel renewed, refreshed and ready to take on the world again! If you need a break or you're planning to take one contact us right away. Our friendly reservation staff are always on hand to assist you in finding what you need with all the special features you need to relax. We look forward to helping you relax!